As more and more students prepare to take the GMAT, Kaplan is there with a ground-breaking prep program unlike any other. 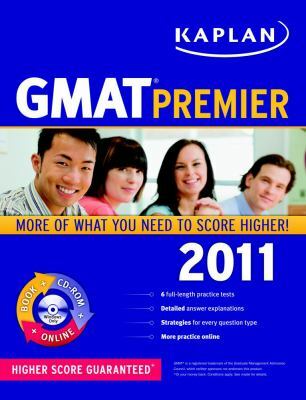 With the latest uses in technology and advanced Internet tools to maximize scores, Kaplan GMAT 2011 Premier with CD-ROMis an invaluable guide that provides proven score-raising strategies and essential practice needed to succeed. Offering exclusive free access to an interactive online companion, this unique guide enables one to achieve a top score by utilizing: Live Online Seminar: A state-of-the-art online classroom in real time, complete with audio, video, instant chat, whiteboards, and screen sharing Fast Fact Videos in which Kaplan’s top instructors review the most important concepts from each chapter Diagnostic quiz to target areas for score improvement Practice quizzes Customizable study plan and progress report This comprehensive preparation program also provides: Valuable insider advice from our top instructors 5 full-length practice tests plus hundreds of additional practice questions Answers fully explained in detailKaplan Publishing Staff is the author of 'Kaplan Gmat 2011, Premier Program ', published 2010 under ISBN 9781419549892 and ISBN 1419549898.